During October, we were excited to receive our new turtle enclosure! 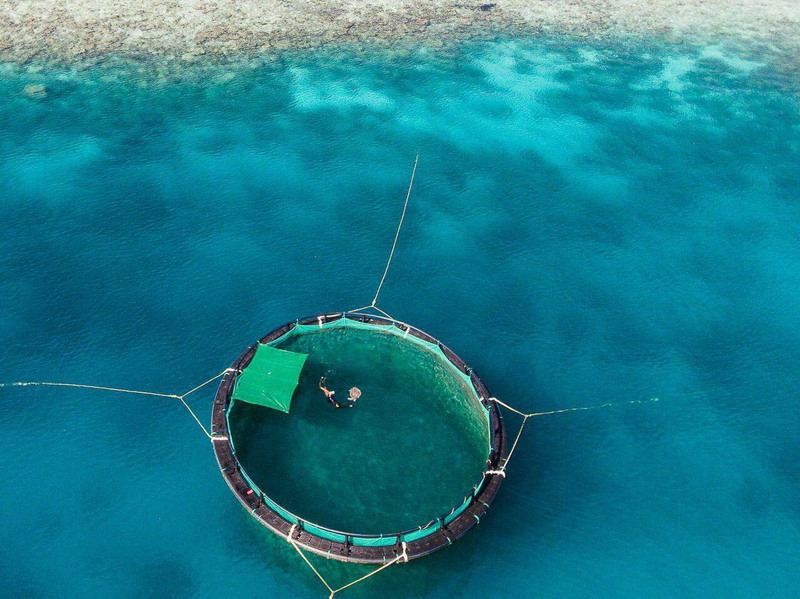 It is a 12m-diameter aquaculture pen, dedicated to our rescued sea turtles and very kindly sponsored by two of our guests, Shazmeen Banks and Sue Olsen (on behalf of the Olsen Animal Trust). 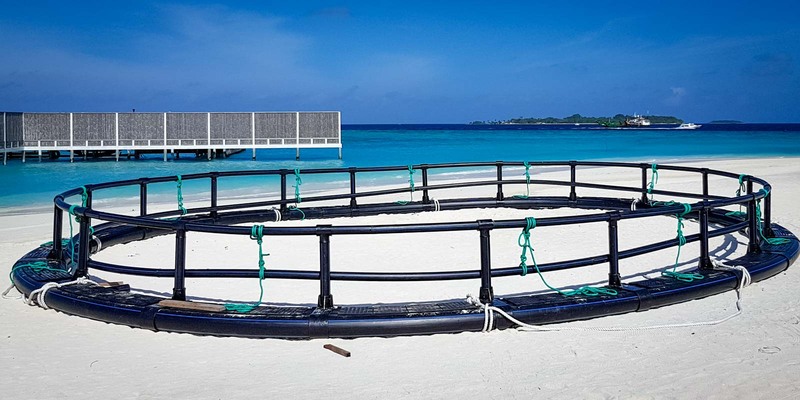 Once the enclosure was successfully assembled, we towed it to a permanent location and anchored it securely at Parrot Reef. We chose Chomper to be the very first test turtle, as his wounds are healed and he shows little buoyancy syndrome (difficulty diving due to trapped air). So, on 14 October we ferried Chomper out to the lagoon for a trial swim … which proved a great success! For the next 10 days, we checked on the empty enclosure daily, to monitor the ocean currents in the area and observe the effects and stability of the new setup. 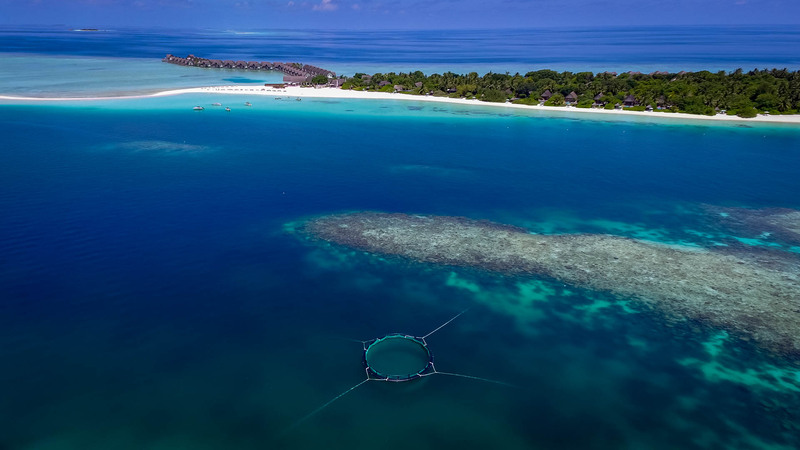 As we predicted, the Parrot Reef location shelters the cage from strong currents and waves, and the relatively fine mesh limits water flow through the enclosure, all of which will aid our rehabilitation turtles to regain confidence in the open ocean environment. On 25 October, we transported Chomper out to the enclosure for a second time, for a longer observation and training session. 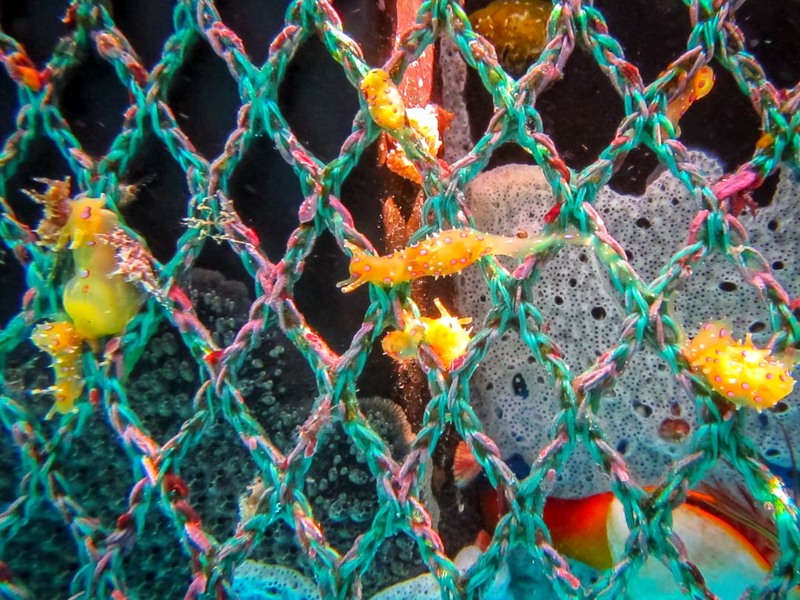 At first, he started to bite the netting, presumably due to the stress of the boat transfer, but he soon started swimming around the entire pen, and trying to dive down repeatedly. After a meal of fresh fish, we transferred him back to his normal pool in our Centre. On 29 October, after a couple of days to recover from the stress, we again ferried Chomper out to the enclosure. He seemed much more relaxed this time, and we fed him and observed his behaviour for several hours. After checking on Chomper again later that same day, we decided to leave him in the enclosure overnight. This proved a success, and Chomper lived in his new lagoon home for 4 full days, during which time we fed and checked on him twice daily. 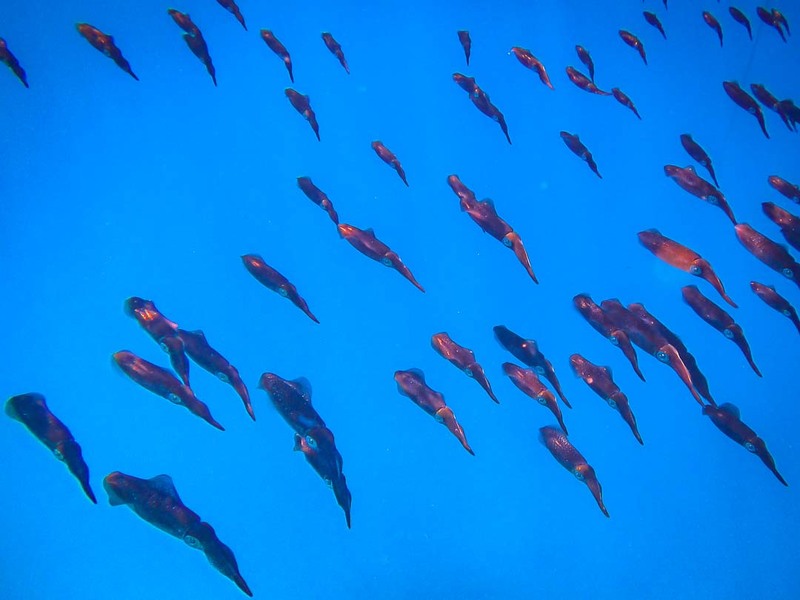 With only two flippers on the same side of the body, it is physically challenging for him to dive much below the water surface, although initially he did appear to be resting slightly lower in the water (less buoyant). He was feeding well, but didn’t actively come to seek the food when it was presented to him in the water, so we had to place it closer to his mouth. After several days of cloud and rain, the weather changed back to sunny and hot, so we decided to return Chomper back to his shaded pool at our Centre. Being stuck floating on the water surface, he is obviously vulnerable during hot weather and indeed seems to have tanned slightly on his carapace and extremities. We have now add a shading tarp to cover part of the enclosure, and Albert has also ventured out to stretch his flippers! 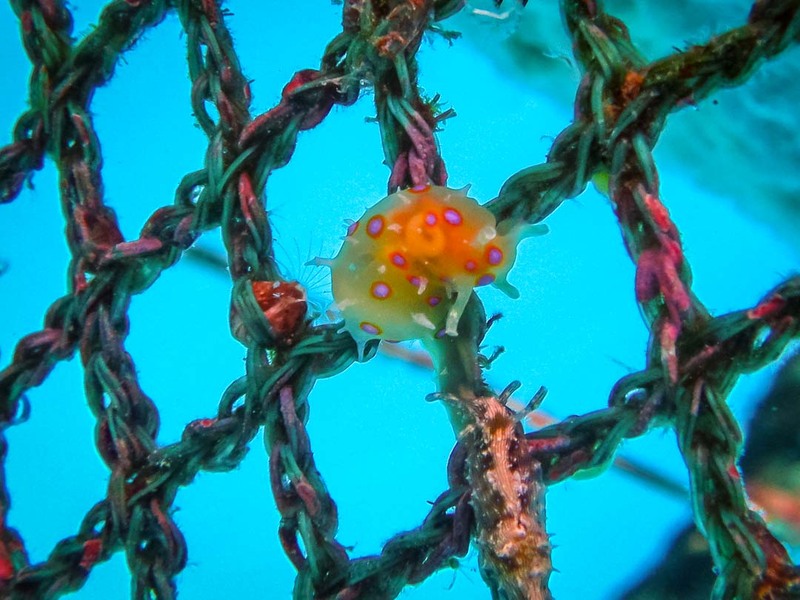 The structure of the enclosure itself seems to attract the growth of algae, but after an initial bloom, several sea hares settled on the netting to feed, thereby ‘cleaning’ the net. We will monitor this as part of our maintenance procedure, along with the new barnacles which have arrived on the ropes and mooring blocks. 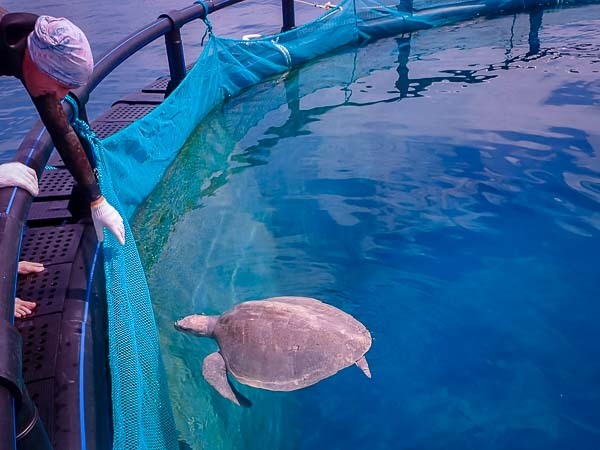 Albert (the new turtle from Kuda Huraa) was relocated to the enclosure from 19-29 November. Following a day of observation back at our Centre, we took Albert along with Frisbee out to the enclosure. Unfortunately, they became aggressive so we immediately returned Frisbee back to the Centre. Albert continues to be observed and fed each day, and is healthy and active in his enclosure. We hope to expand the shading in the coming days, and our new materials have arrived (shading fabric, PVC pipes and ropes). 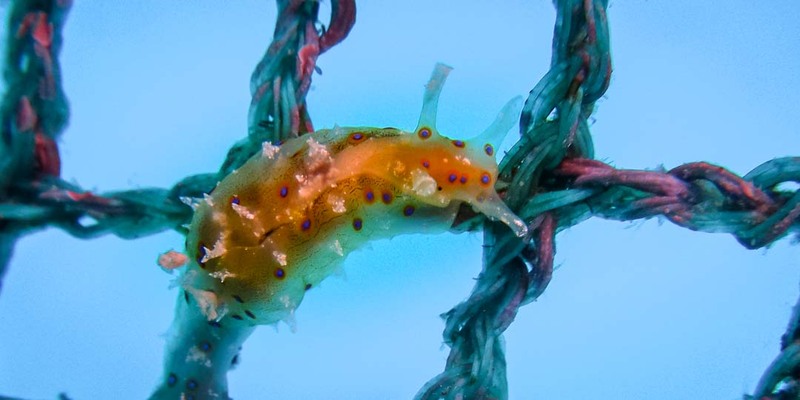 The recent bloom of algae and the long-tailed sea hare (Stylocheilus longicauda) which we observed during October has passed, and we haven’t spotted any sea hares recently. We document all activities and observations of the enclosure, and periodically update our sponsors (Mrs Banks and the Olsen Animal Trust) with a detailed report. Chomper – 7½ days. Chomper’s buoyancy syndrome improved after a few days, and he was seen to be floating lower in the water. He was very active during feeding times, swimming and diving down to the middle of the enclosure. Albert – 3½ days. We are introducing Albert to his new enclosure progressively (4-12hrs/day). During feeding times, he is not very active and continues to be a fussy eater. He is staying at the edge of the cage. The last days he showed more interest for the food. We will try to feed him with lobster as it was his favourite food in Kuda Huraa. 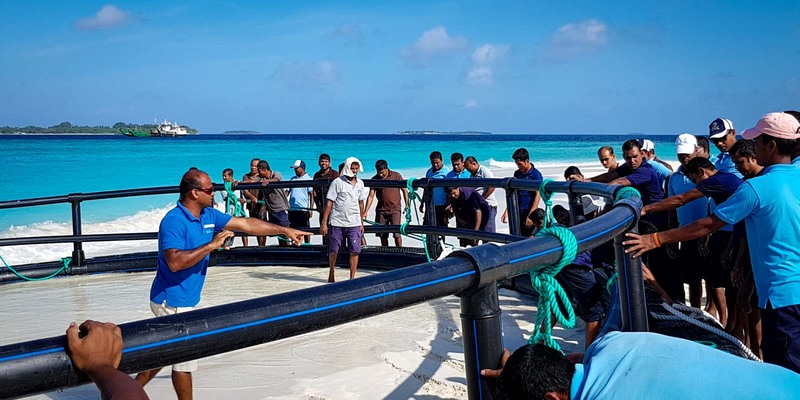 27 September – Enclosure kit arrives at Landaa Giraavaru. 6 October – The engineer (from Shandong Aidi M&E Technology, China) arrived to supervise assembly. 7-10 October – Assembling the enclosure on the beach. 11 October – First launch of the walkway in the water (without the netting). 13 October – Net and mooring blocks fixed into position. 14 October – Chomper inaugurated the pen, and he soon settled in. 31 October–3 November – Chomper returned to the cage. 7 November – Temporary shade tested. 19-22 November – Albert lived in the pen for 4-12hrs, during the mornings and evenings (avoiding highest sun exposure). The turtle is wrapped in a wet towel and transported to the pen via small motor boat (3 minutes). The housed turtles are monitored for 30-45 minutes, twice per day at feeding times (10:00 & 17:00). 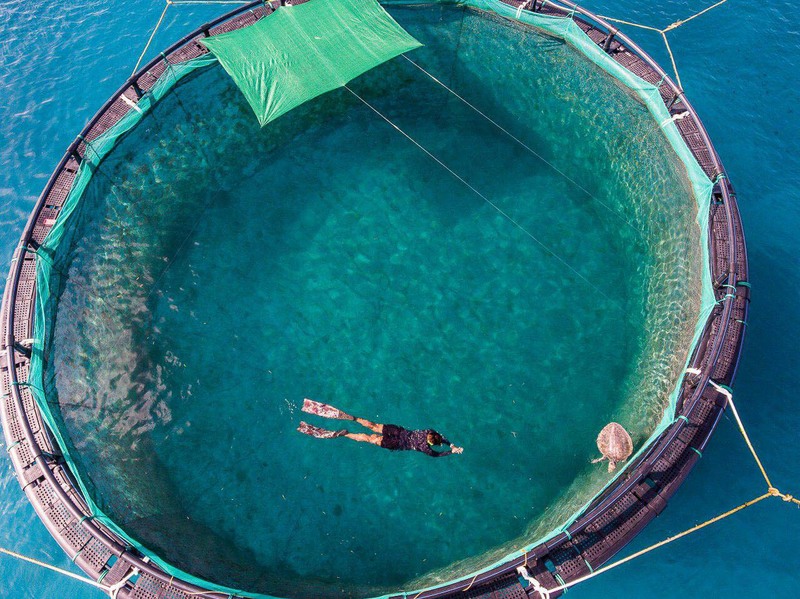 The turtles are encouraged to swim and dive for food. In anticipation of bad weather, we monitor closely and return the turtles to our Centre if necessary. Weekly, we follow our turtle-care protocol to check health status (weight, length, healing progression, full body check-up). 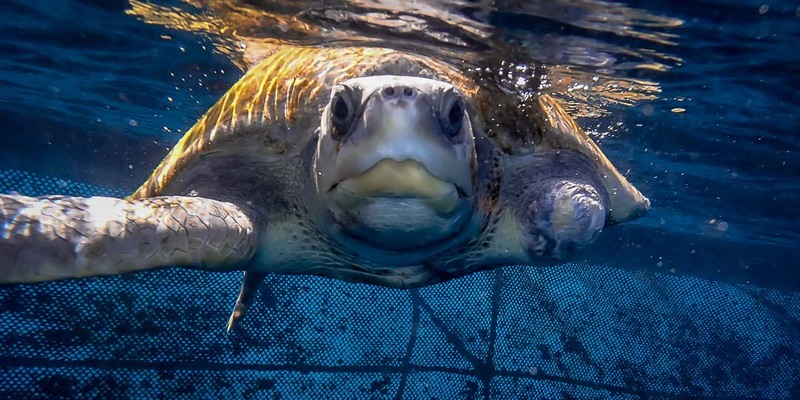 Only healthy turtles that require minimal treatment can be left out in the enclosure. 5 December – Albert was returned to our Centre for care, and the following day we installed extra shade at the sea-based enclosure. We assembled the PVC pipes for the shade’s structure, and towed them and the shading material out into the lagoon behind the whaler. The final assembly and gluing were done at the enclosure site. Knotted ropes and cable ties secured everything in place, with approximately half the area now being shaded. We will soon be installing additional weights (6 x 25kg) to better balance the shade and framework of the enclosure. 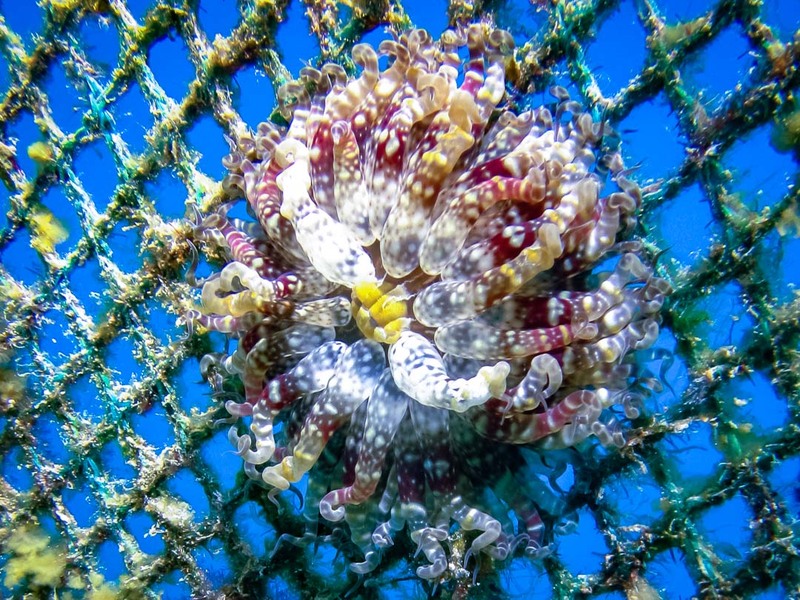 9 December – We used brushes to clean the enclosure netting for accumulated green algae and sponges (the sea slugs that fed on the algae have disappeared). 7 December – Albert was taken back out to the enclosure, and he took a few minutes to settle in to the new surroundings. 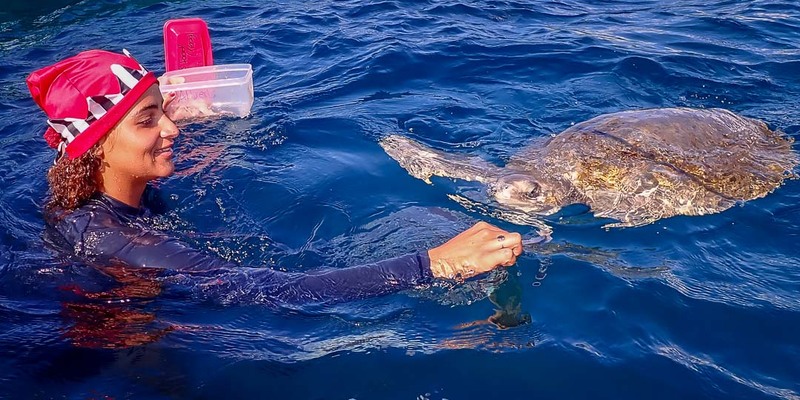 Over subsequent days, it was sometimes challenging to feed him, as he is not very mobile with just two flippers, and the wave motion makes it difficult for him to catch food. Additionally, on some days when we would arrive at the enclosure for feeding, rather than swimming towards us he seemed scared and would swim away, trying to dive but without success. 19 December – Albert was returned to our Centre for care. 19 December – Indianna was taken out to the enclosure. 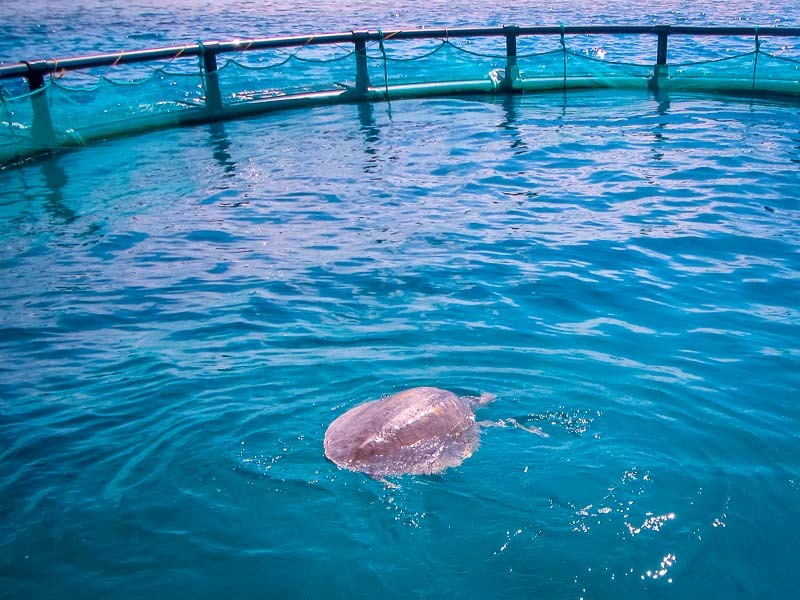 Her flipper wound was healing, and she was diving well inside the small recovery pool, so we decided the extra space inside the sea-based enclosure would be beneficial to develop her diving skills. 20 December – We added Varugadha to the enclosure, who is floating but will hopefully start to dive soon. The 2 turtles seemed to get on well. 21 December – We observed Indianna biting Varu, so we returned Varu to the Centre. 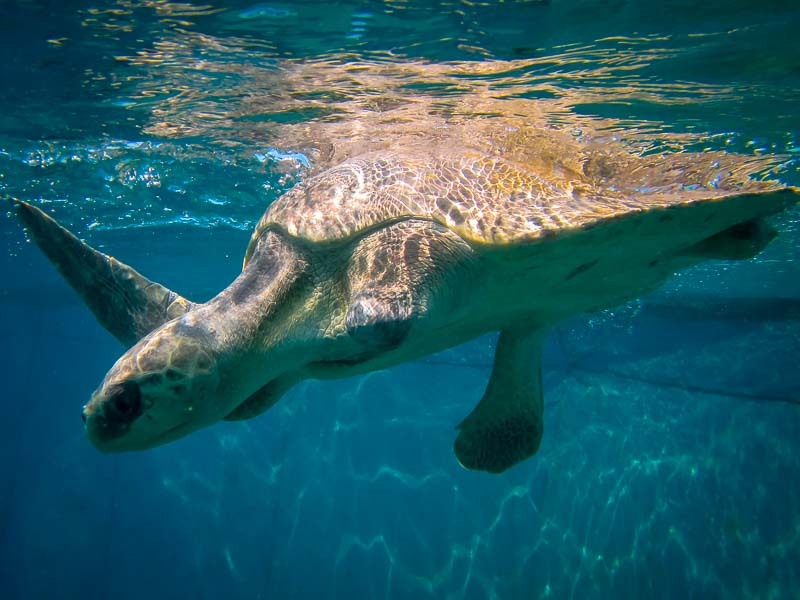 We later observed that Indianna was not diving down to the bottom of the enclosure to feed (she has not yet accepted hand-feeding) maybe because her left (injured) front flipper seemed swollen at the elbow joint. 22 December – We returned Indianna to the Centre for treatment and observation. 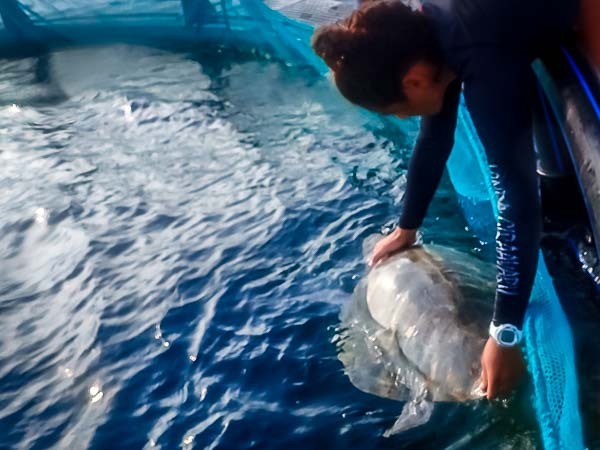 22-31 December – Albert lived happily in the sea-based enclosure, including a care session on 27 December on the enclosure walkway (measured, weighed, scrubbed and photographed). Christmas lunch in the turtle enclosure! 4 January – Albert developed a fungal infection and was retrieved from the enclosure. He also showed some abrasions on his stumps caused by contact with the net. The enclosure then remained empty as the waves were quite choppy, and most of our turtle patients needed intensive care and treatment. During this time, we extended the shade covering, adding weights and ropes to prevent the structure from flexing. 26 January – Chomper was transferred to the pen, and he seems happy and active. 27 February – we returned Chomper to our Centre for treatment for abrasions, and we transferred Frisbee out to the pen.